The group Partido Manggagawa (PM) called for immediate assistance to victims of the massive factory fire in the Cavite ecozone. 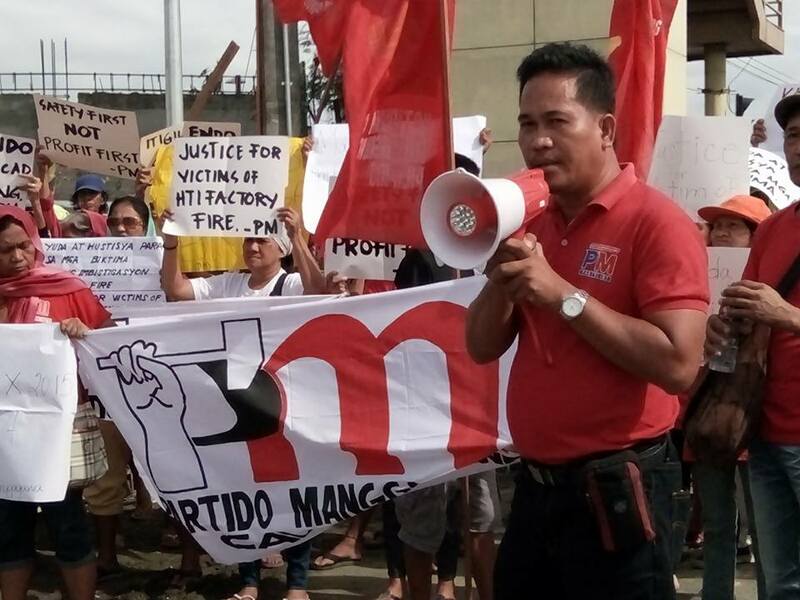 Members of PM and the Katipunan ng Manggagawang Pilipino (KMP) trooped to the Cavite EPZA this morning to demand a transparent investigation and justice for workers injured or killed in the industrial tragedy reminiscent of the Kentex fire in 2015. “We condole with the victims of the fire at House Technology Industries (HTI). We ask too the Singaporean owners for prompt aid for the victims and a thorough probe of the accident. Justice must be served for casualties among HTI workers,” stated Dennis Sequena, PM-Cavite coordinator. He noted that there was a previous fire at HTI in 2012 and so it seems occupational health and safety standards may not be up to par. There was a 10-hour fire that started at the boiler department of the HTI factory in October 19, 2012 and lasted up to early the next day. “Stronger labor enforcement and labor inspection are needed in response to the deadly industrial fires at HTI and Kentex, and loss of lives at several construction sites amidst the current real estate boom,” he argued. PM reminded employers not to cut corners in occupational safety in order to raise profits and called the attention of the Department of Labor and Employment (DOLE) for the lax implementation of labor and safety standards inside the ecozone. “While capitalists were scrimping on protection for workers and DOLE was sleeping on its job of enforcement, workers are dying and being injured in the workplace all around the country,” Sequena elaborated.